Over the years, hundreds of pupils have passed their driving test with J.C’s Driving School. Below are a few examples of the testimonials/feedback we have received recently. If you learned to drive with J.C’s Driving School, we would love to hear from you. Just get in touch to submit a testimonial. It does not matter when you passed, we would just love to hear from anyone who was successful during our 25+ years in business. “Mark made it feel like it wasn't really a lesson, so thank you for being friendly and making the stress of learning to drive significantly less :)” Jack, Backwell. "I have greatly enjoyed my time learning with J.C’s Driving School. Mark is an extremely well qualified instructor, with an impressive history of experience in driving instruction. Whilst I was a little nervous with taking my first steps with driving, Mark made learning to drive fun with his interactive and engaging style of instruction, catered specifically around my own perceived areas of weakness. I also found the reading material provided extremely useful in preparing me during the days leading up to my test. Speaking now as a first-time passer, I would certainly recommend Mark and J.C’s Driving School to any new learners out there. " Tom, Nailsea. “Just a note to say thanks for your help and support in teaching me to drive and passing my test. I really enjoyed the lessons and valued your support” Matt, Nailsea. "Couldn't recommend J.C's more, particularly Paul who instructed me. Very patient and very supportive of my learning giving me the confidence to persist at passing my test" Molly, Nailsea. very supportive, friendly, extremely patient and all round fantastic teacher. Thanks once again Paul” Joanne, Nailsea. “Hi Mark, I just wanted to say a big thank you for helping me pass my practical driving test 1st time earlier today. After trying out a few driving instructors you were the first one who made me feel like I understood what I was doing and I actually looked forward to going for a lesson!” Mitch, Nailsea. “I have to say a big thank you to you as well, your encouragement really was the tipping point.., you are a credit to your profession and may I wish you all the best too. Thank you, from a very proud Dad” Mitch's Dad, Nailsea. "Mark is patient and incredibly knowledgeable about anything to do with driving. Had a great time learning from him and would definitely recommend." Calum, Nailsea. “Mark is a great driving instructor. He went through everything thoroughly and put confidence in my ability! Highly recommend J.C's, great experience with the hugely productive lessons!! Jack, Nailsea. “A massive Thank You to J.C’s Driving School! Mark you have been absolutely amazing, you’re calm, patient and extremely professional. And we also had a lot of laughs along the way! Anyone looking to start their driving lessons then I would strongly recommend J.C's driving school! He's an awesome driving instructor! :D” Ryan, Nailsea. “Would love to leave a review on your website but can't work out how too lol, just wanted to say a huge thank you to J.C’s Driving School instructor Paul 🙂 due to many personal situations over the years I was never in a position to be able to learn to drive. I eventually decided last year to try and learn to drive after being free from my past circumstances, so I might finally be able to take my children on days out, and just generally give myself more independence. I doubted my ability, but Paul didn't 🙂 he was amazing. So kind, understanding of my fears, but completely believed in me. And in less than a year from my first ever time behind a wheel, I have passed my driving test. The feeling of being able to take my children on days out, little things like going shopping etc on my own, has just been amazing. And all made possible by Paul. Huge huge praise to this man. I enjoyed my lessons with him, and thoroughly recommend him. He doesn't feel like a bossy instructor when you get in his car, he makes u feel comfortable and at ease, a friendly face. You look forward to your lesson time with him as he's just such a lovely friendly person. Again a huge thank you :)” Abbi, Yatton. “J.C’s Mark provided really patient, clear and informative lessons which were tailored specifically to help my personal learning at a comfortable pace” Ollie, Nailsea. “Thank you so much for all your help Mark! Actually so relieved I passed knowing I had to! Felt so good to wake up today knowing I could drive my car to work! Actually can't put it in to words! So happy!! Thank you!” Ryan, Nailsea. “Learning with Mark at J.C's Driving School has been enjoyable and rewarding from the very first lesson. - My instructor gave me confidence to progress with my driving through well planned and executed lessons. - It was great that each lesson was suited to my ability and areas, which I needed more practice on. - Complex and daunting manoeuvres were simplified with memorable slogans which will stay with me as a driver for life!” Dee, Nailsea. “Thanks very much to Mark for teaching me how to drive. He was very patient and provided professional lessons” Ryan, Nailsea. “Thank you, Thank you for brilliant lessons” Alex, Nailsea. “Thank you for all your training. Feel like a very confident driver now” Jamie, Nailsea. “I'd say that learning with you has been a friendly and engaging experience where I could always get an answer to any question that I might have had” Larry, Nailsea. 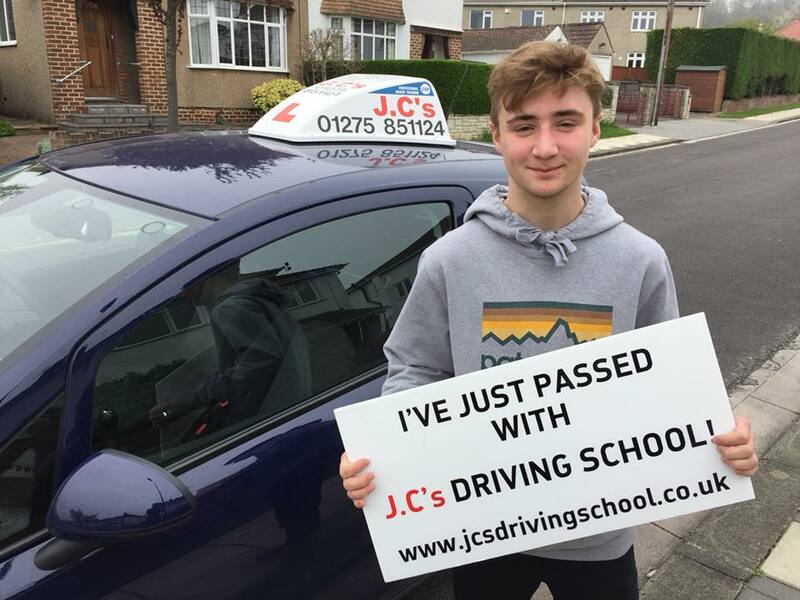 “Absolutely amazing experience learning to drive with J.C’s. Always patient and calm. Made learning to drive a pleasure!” Maya, Nailsea. “Just wanted to say thank you for teaching Finn. He is over the moon and so am I” Finn's Mum, Flax Bourton. “Thank you for being a brilliant Instructor” Finn, Flax Bourton. “Learning to drive with J.C’s felt really comfortable. Mark did a good job at putting me at ease” Owain, Nailsea. Having Mark as a driving instructor was a pleasure. I couldn’t have wished for a better instructor 👌 Elliot, Nailsea.